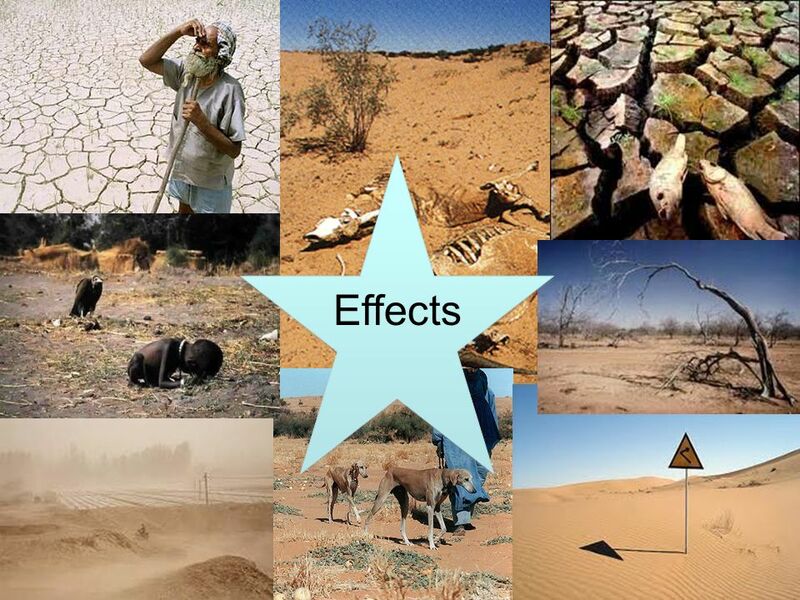 Challenges in hot deserts L.O -To be able to describe the causes and effects of a hot desert challenge. 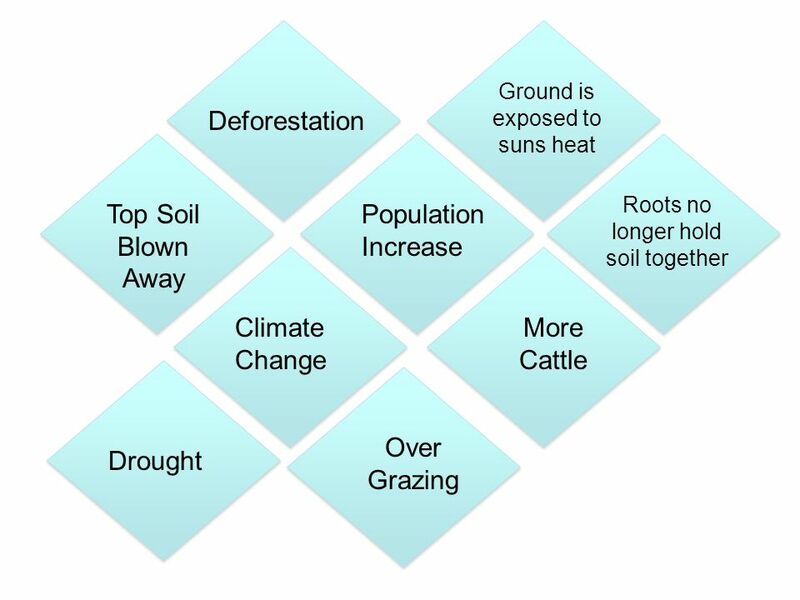 Key Words CausesDeforestation EffectsGrazing Desertification. 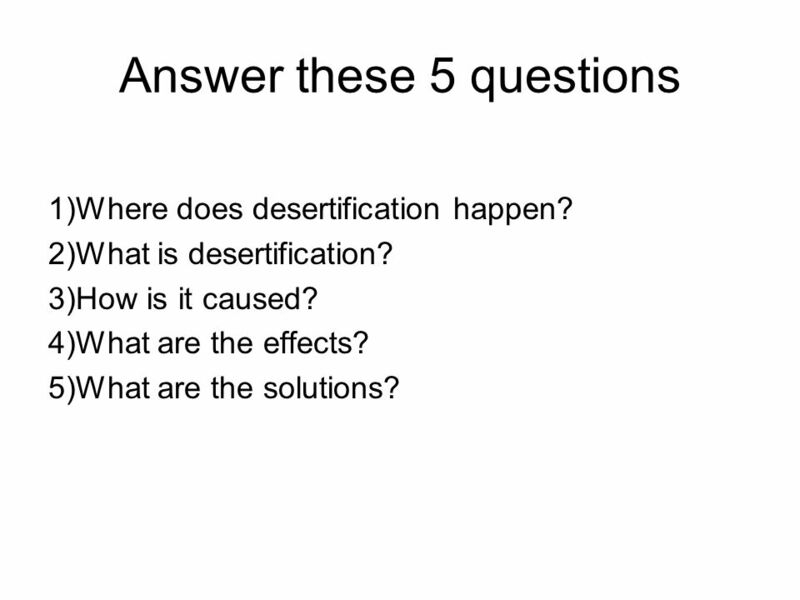 4 Answer these 5 questions 1)Where does desertification happen? 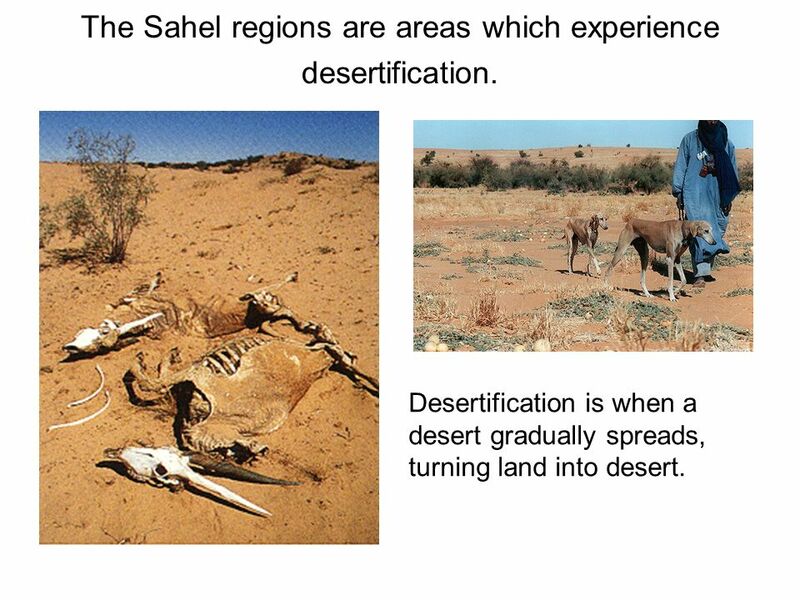 2)What is desertification? 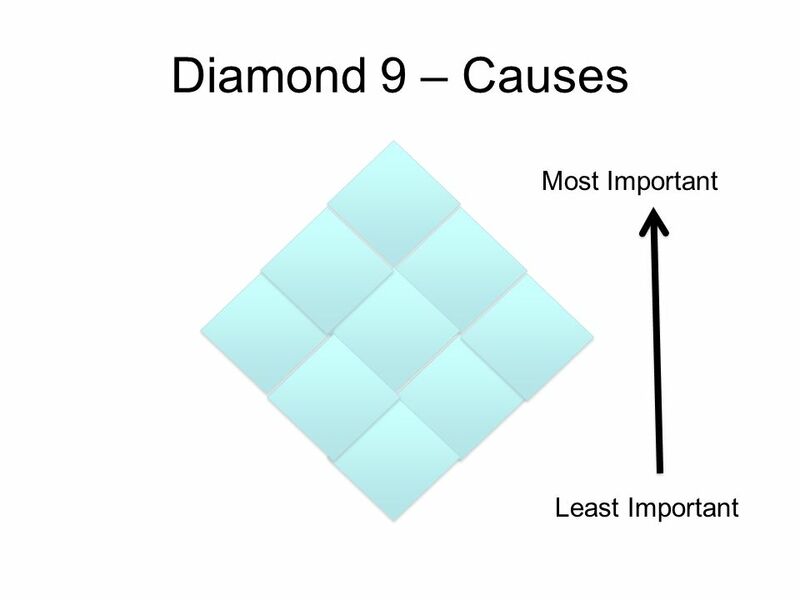 3)How is it caused? 4)What are the effects? 5)What are the solutions? 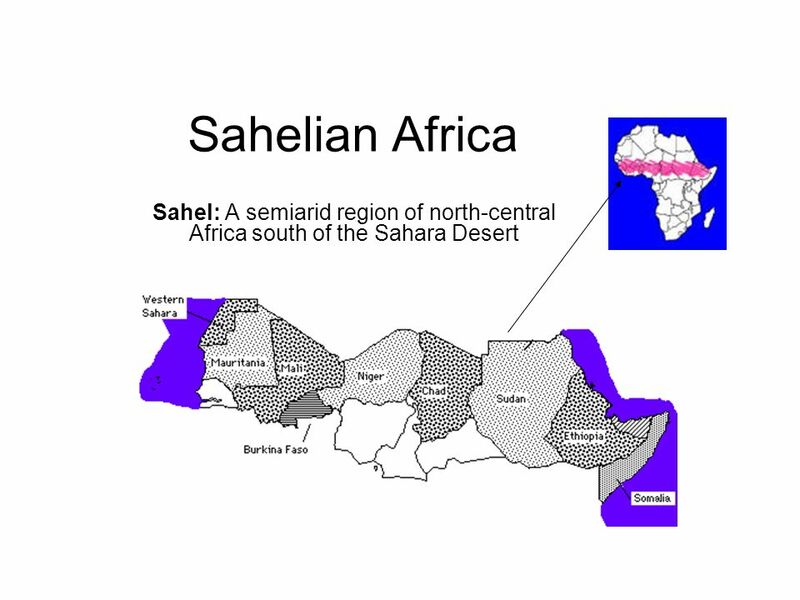 6 The Sahel regions are areas which experience desertification. Desertification is when a desert gradually spreads, turning land into desert. 8 Since the 1960s the Sahel has been afflicted by prolonged periods of extensive drought. The above plots are June through October averages of the Sahel rainfall series. The averages are standardized such that the mean and standard deviation of the series are 0 and 1, respectively, for the periods identified in each plot. 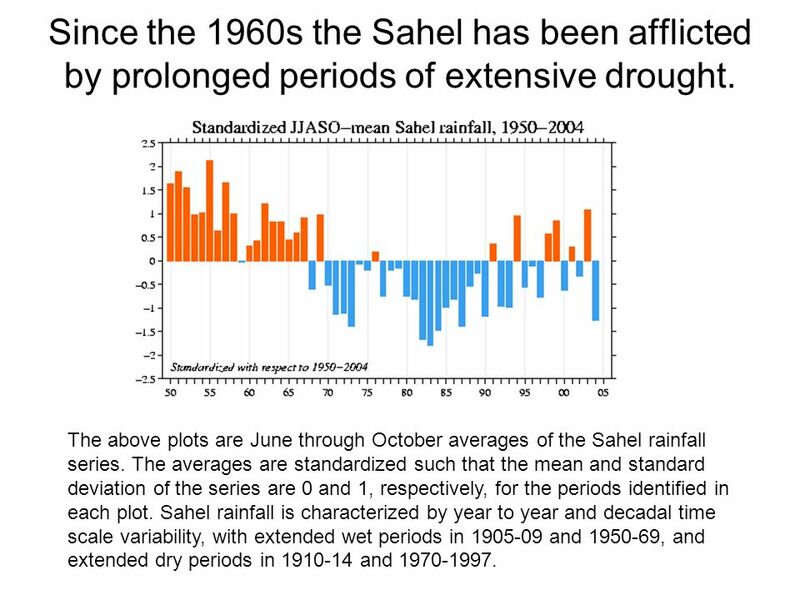 Sahel rainfall is characterized by year to year and decadal time scale variability, with extended wet periods in 1905-09 and 1950-69, and extended dry periods in 1910-14 and 1970-1997. 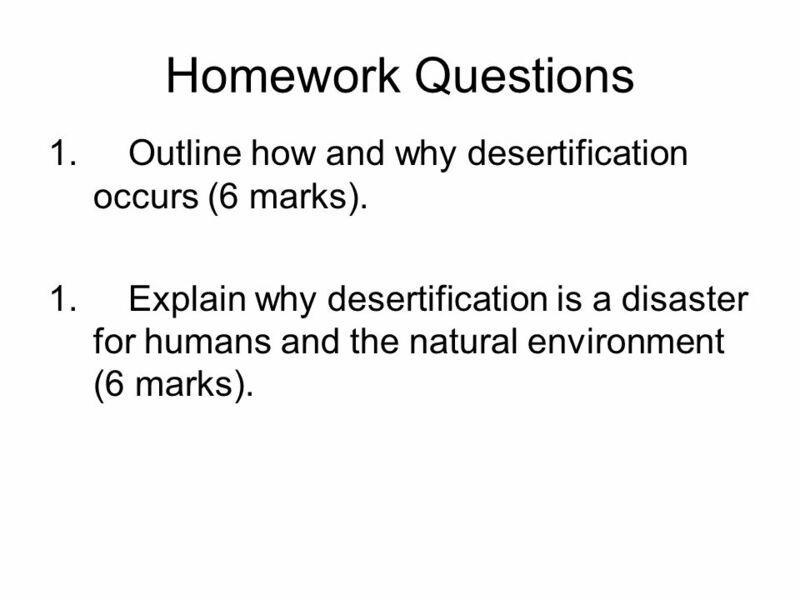 12 Homework Questions 1.Outline how and why desertification occurs (6 marks). 1.Explain why desertification is a disaster for humans and the natural environment (6 marks). 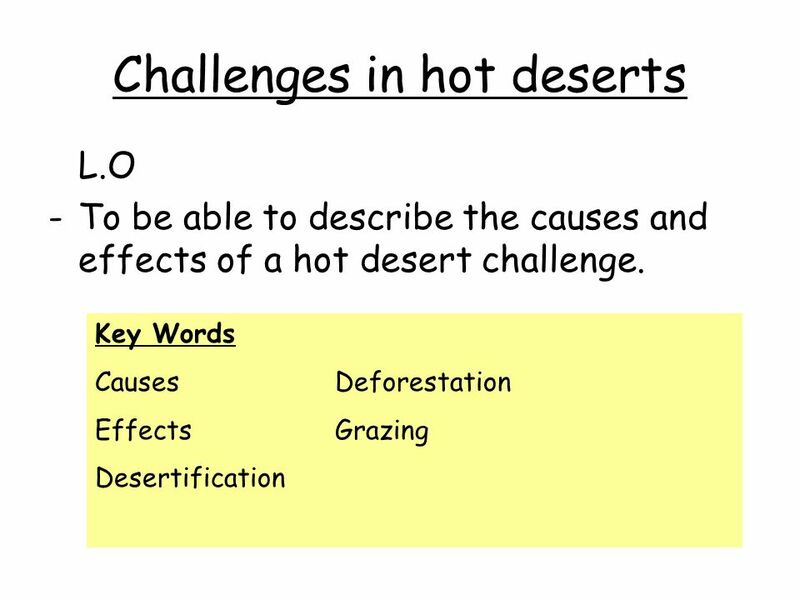 Download ppt "Challenges in hot deserts L.O -To be able to describe the causes and effects of a hot desert challenge. Key Words CausesDeforestation EffectsGrazing Desertification." Strands a. 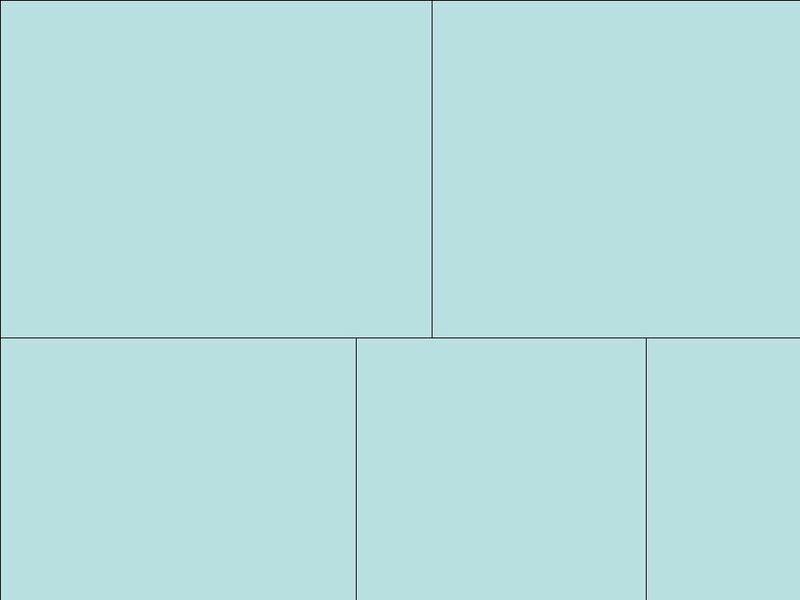 Explain how water pollution and the unequal distribution of water impacts irrigation, trade, industry, and drinking water. b. Explain the relationship. Seasons Seasons are periods of time over the course of a year during which certain weather conditions prevail. Climate describes the average weather conditions. 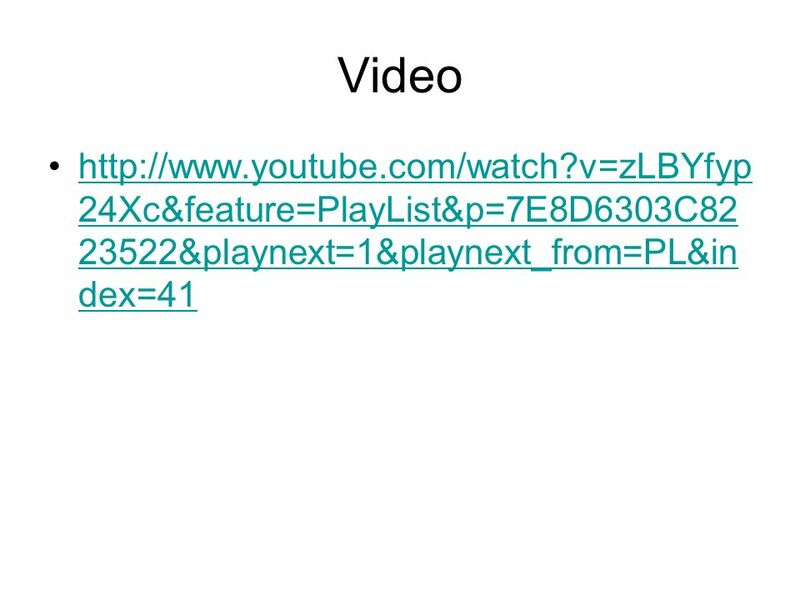 How are these pictures linked?. Desertification Case study By the end of the lesson you will; 1)Described the causes of desertification in Ghana 2)Have. 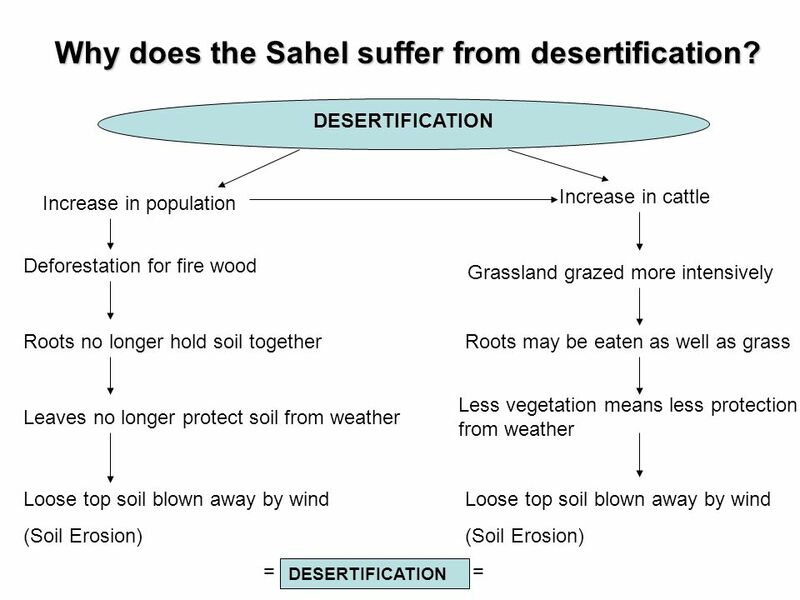 Adapted from Chesterton Community College – Desertification Project PP. Homeroom Go to the RR and lockers – No book bags! 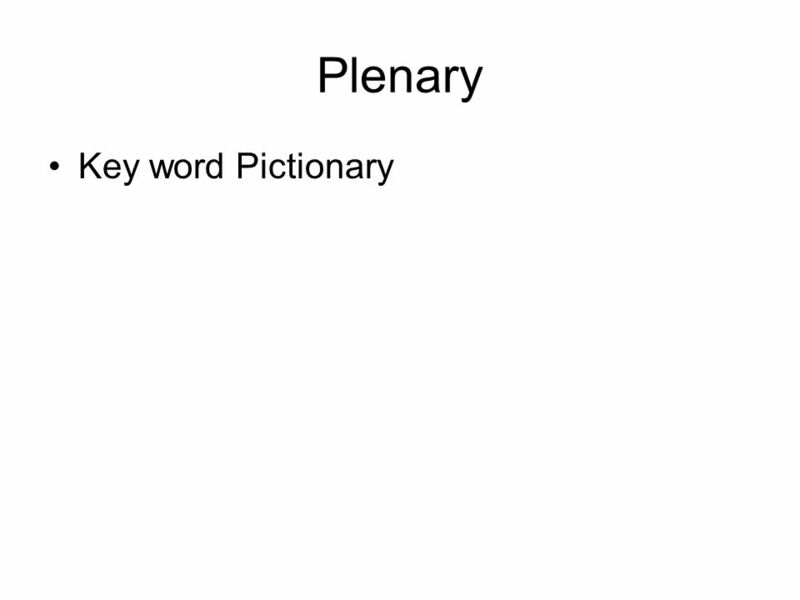 We are taking notes in class today so HAVE SOMETHING TO WRITE WITH. Overpopulation Impact on Resources. Effects of Overpopulation on Resources Overpopulation can lead to the overuse and degradation of resources. Rural Land Degradation Higher Geography Applications. Deforestation: The result of cutting down trees to use for money & free up land for farming. 1. Problem: Cutting down trees leads to erosion (wearing.